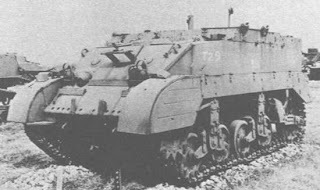 Notes: The M5 is an upgraded and up-armored version of the M3 Light Tank. Be sure to get the core Battleground WWII rules so you can use these awesome rules to the fullest. 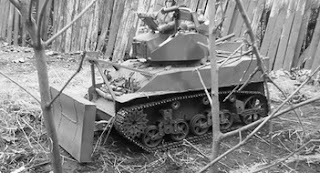 Users: These rules are for the various models of the M5 used by US forces. 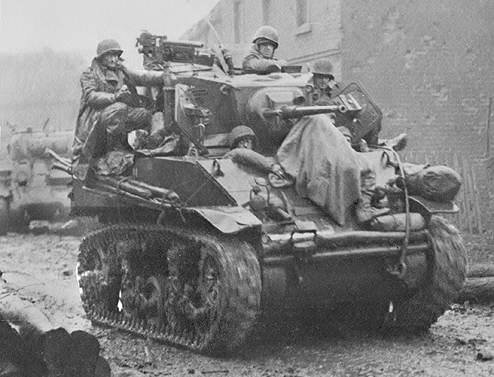 Vehicle Chart: We use the M5A1 vehicle chart from the Tanker's Challenge supplement and modify where needed. Crew: All M5 variants have a crew of 4 (commander, gunner, driver, asst. driver/radio op.) 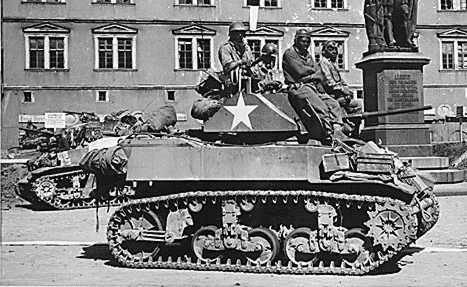 with the exception of the M5 AA tank, T27/T27E1 MMC and the T29 GMC will have crews of 5 (commander, gunner, loader, driver, asst. driver/radio op.). High Ground Pressure: All M5 models, except for the M1A1E1, will suffer from high ground pressure and will suffer a +1 to all Bog Checks as such. Unarmored Ammo Storage: Because of the M5's poor ammo storage, it was prone to catch fire if penetrated. Penetration Effects are at a -1 for all M5 models that carry ammunition for a cannon it is mounted with. 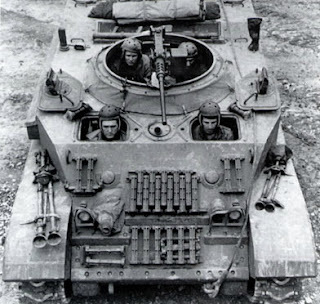 AAMG: The mount for the AAMG is mounted on the right side of the turret next to the gunner's hatch making it only usable against targets on the right side of the vehicle. This rule is only for the M5 models with fully enclosed turrets. Fixed Spotlight: All fully enclosed turreted M5 models can have a small spotlight fitted to the turret above the main gun's position. The spotlight will illuminate a 45-degree cone and extend out to 28" directly forward of the turret's current position. Availability is a 10. Commander As Loader: The commander serves as loader for the main gun. The commander may not be exposed on an action where they load the main gun, but may be exposed too direct fire in a subsequent action to avoid the No Commander penalty. Duck Bills: M5s can be fitted with grousers to negate the vehicle's high ground pressure. The Availability is 10 for these track additions. 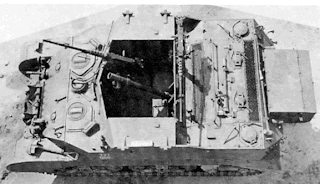 Sandbag Racks/Wood Siding: It was common for M5s to fit numerous sandbags in make-shift racks on the hull to help protect itself against enemy HEAT anti-tank weapons. These racks will cover locations 3-4 and 7-16 on the HF and locations 9-15 and 17-19 on the HS. This barrier of sandbags will half any HEAT weapon's AP only once per location covered. These racks will also cause a +10 penalty against any Close Assault Placement roll against the locations covered using magnetic mines or other similar AT weapons. Note that due to the increased weight of the sandbags, any vehicle fitted with this addition will have a movement penalty of 2" per action. The Availability for these upgrades is a 12 for the front hull rack and a 10 for the hull side racks. 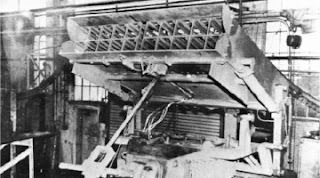 In the PTO, it was more common for tank crews to affix wood to the hull to help defend against such attacks and it offers the same benefits as the sand bag racks noted above. Availability for is type of addition is a 16 in the PTO and a 8 in any other theater. Bird Cages: Because of Jap suicide anti-tank hunters and their tendency to place explosives on the hatches of American takes, the crews often welded wire cages over their hatches to leave a space between the hatch and explosive to help deflect the explosion. If fitted, a bird cage will half the AP at that location once. Any subsequent attack to the same spot will not benefit because the bird cage was destroyed from the previous attack. Note that this is an exclusive upgrade found only in the PTO so any other theater will have an Availability of 1. M5s in the PTO will have an Availability of 10. M2 Canister Shell: The M2 shell was in essence a large shotgun that fired 122 steel balls in a devastating short ranged pattern. To fire the M2 just use the normal rules to fire the main gun and then place the 37mm Canister template 6" directly forward of the barrel and roll as normal for anything under the template. Anything within the path of the 6" before the template is placed is considered to be hit with an A column hit. Note that because the shell is in essence a shotgun shell, it can be used whilst on the move without the normal To Hit modifiers for firing whilst moving. The Availability is 15 in the PTO and a 10 for all other theaters with D10+5 shells available. Open-Topped: The command, weapon carriers, E8 flame gun equipped vehicles and AA models of the M5 are all Open-Topped vehicles and will be bound by those rules as such. Tarpaulin Cover: All Open-Topped models are equipped with tarps as basic kit. 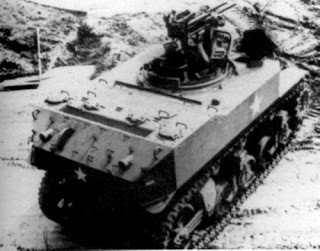 Gyro-Stabilizer: The M5, M5A1 and M5A1E1 are fitted with a gun stabilizer that increases accuracy when firing on the move. The stabilizers are not very popular with the crews because it takes extensive training and maintenance to benefit from its use and many crews would rather stop and fire instead. The crew must pass a 1/2 Skill Check at the beginning of the battle to use this piece of equipment. Any M5 with a working stabilizer has a reduced To Hit penalty noted below. The M5A1E1's auto-cannon will be at a +3 To Hit when both moving while firing as well as firing in previous action. Cullin Device: During the breakout of the Normandy beach head, the Allies were menaced by the French countryside in the form of thick walls of brush and trees on either side of ancient sunken roads called, Bocage. An ingenious idea to weld sharpened metal struts to the front of a tanks was implemented in which the tank would bash its way through the Bocage. For the detailed rules for this upgrade, check out the Normandy Nightmare supplement. Availability is 5 and only in the ETO. 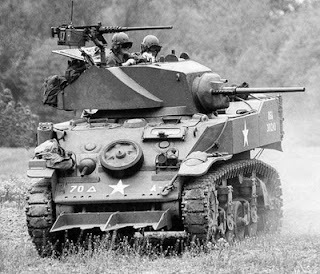 M5A1E1: The M5A1E1 is fitted with an automatic 37mm auto-cannon. To fire the M2 canister shell, the commander must spend an action to load it and the weapon will fire the canister round for the next two actions of fire unless is it unloaded. M3A1E1 models will only be equipped with D6 actions of the M2 shell per battle. M5 Flame Tank: Some M5 models were fitted with a simple man-portable flamethrower in place of the bow machine gun. This easy conversion allowed any vehicle to become a deadly armored flamethrower. The flamethrower is operated by the asst. driver/radio op. and takes an action to fire within the normal fire arc of the machine gun replaced. The flamethrower has enough fuel for 8 shots and will use the Man-Portable flamethrower template. The tip of the template will be placed 2" directly in front of the flamethrower's position. Any prone figures between the template and tank will make an immediate Morale Check and any standing will suffer an automatic Gory Death. All normal flamethrower rules apply. In addition, any penetrating hit to the front 8 location or right 10 location will result in an automatic Catastrophic result on the Penetration Effects chart. Availability is a 15 for any vehicles in the PTO and a 10 for all other fronts. State Guard units will have an Availability of 5. M5A1 Flame Tank: M5A1s were sometimes fitted with a E7-7 flame gun which replaced the 37mm gun within the vehicle's turret. The loader was no longer needed and their position was replaced with the flamethrower's fuel tank. The flamethrower has enough fuel for 10 shots and will use the Vehicle-Mounted flamethrower template. The tip of the template will be placed 2" directly in front of the flamethrower's position. Any prone figures between the template and tank will make an immediate Morale Check and any standing will suffer an automatic Gory Death. All normal flamethrower rules apply. Any penetrating hits to the front 18 and 19, right 18, rear 17 and 18 and top 8 locations will cause an automatic Catastrophic result on the Penetration Effects chart due to the penetration of the flamethrower's fuel tank. The weapon takes an action to fire by the tank's commander. The co-aux machine gun is still present so it can be used as well but not in the same action of firing the flamethrower as normal. Availability is a 10 in the PTO and a 5 in all other theaters. The turret has a normal turret rotation. 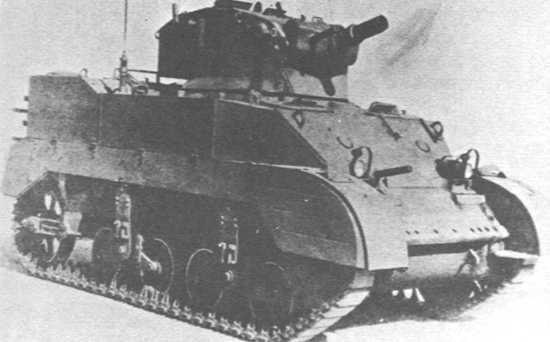 M5A1s w/E8 Flame Gun: Some M5A1's turrets were removed and a rudimentary box-shaped turrets housing an E8 flame gun was fitted in its place. This conversion will use the same rules above as the M5A1 that is fitted within the E7-7 flame gun with the exception that the new turret will not have a co-aux machine gun or AAMG and will have a normal turret rotation. Availability for this model is a 2 on any front. M5A1 w/E9-9 Flamethrower: This flamethrower is powered by a high pressurized projector and has a large fuel tank that is located in an armored trailer that is towed by the tank. The bow machine gun is replaced with the projector and is operated by the asst. driver/radio op. and takes an action to fire within the normal fire arc of the machine gun replaced. The flamethrower has enough fuel for the entire battle just as long as the fuel trailer is still present and attached to the tank. Shots and will use the Vehicle-mounted flamethrower template. The tip of the template will be placed 2" directly in front of the flamethrower's position and the template will move forward an additional D12". Any prone figures between the template and tank will make an immediate Morale Check and any standing will suffer an automatic Gory Death. All normal flamethrower rules apply. In addition, any penetrating hit to the HF 8 location will result in an automatic Catastrophic result on the Penetration Effects chart. Availability is a 5. The trailer is targeted like any other vehicle and is considered a medium-sized vehicle. If hit, there will be no need to roll for location. The trailer has an AV of 2. If penetrated, there is no need to roll on the effects charts but instead a D4 is rolled. On a score of 1-2 the trailer will exploded! Place the Medium blast template center of the trailer and count it as if a flamethrower with the A-C rings are considered the inner red zone and the D-E rings is treated like the outer yellow zone. A score of 3-4 will wreck the trailer making it unusable. The trailer will also be detached from the vehicle as well. M3 2" Mortar: The T8 model is fitted with a fixed 2" mortar fitted within the front hull between the driver and asst. driver. The M3 is able to fire a signal, illumination and HE round as well as smoke but because of the weapon being in a fixed position it was much easier and effective to use a grenade, vehicle's machine guns or a hand held flare pistol instead of the M3's other shells. When using the M3's smoke or HE round, the round will land 12" directly in front of the vehicle when fired and uses the Small HE template. Signal flare rounds are of limited use due to the round's low trajectory and will only be seen by those who have LOS to its 12" movement from the vehicle's front. The illumination round was useless because of its low trajectory and will not be supplied to T8 crews. The weapon was operated by the vehicle's asst, driver and it took an action to load and another to fire. Note that any penetrating or non-penetrating round hitting the HF 14 location will neutralize the M3's use. Because of the limited use of the weapon, its Availability is 10. Psy-War M5: Psy-War M5s have an external loudspeaker attached to the turret which is used to demoralize the enemy with psychological warfare taunts and information. To use the loudspeaker, the commander will expend an action to perform his Psy-War duty. The loudspeaker's intelligible range has a 25" radius and an unintelligible range of 35". Psy-War units will always increase the Morale of any friendly units within its intelligible range by one point and always deduct one point from any the enemy's Morale within the same range. Every enemy unit within intelligible range of the Psy-War M5 will roll a D10 on the chart below to see what its effects have on them. Enemy units will only ever have to roll on the chart once in any given battle. Spooked! The unit has been spooked and will immediately break. The unit can be rallied but only by a leader of a Troop Quality of Elite or higher. Shaken! The unit has been shaken by the Psy-War unit and will have to make an immediate squad Morale Check. No Effect! The Psy-War has no effect on the enemy unit and they can act normally for the remainder of the battle. Pissed! The unit is pissed from the Psy-War commentary and immediately becomes Fanatic for the duration of the battle. Enraged! The unit is enraged at what they have heard and will become Fanatic. In addition, the unit will also immediately get two free actions against the Psy-War unit only. If the Psy-War M5 is struck where its loudspeaker is located then the speaker will be destroyed even if it didn't penetrate the said location. The Availability of this type of unit is a 3 and there can only be a single Psy-War unit on the battlefield at any given time. Dozer Tanks: M5s were sometimes fitted with a dozer blade used for various duties. If a BM is present, let them decided the number of actions needed to push an obstacle clear. If no BM is present then roll a D6 to see how many actions it will take the M5 to clear the obstacle. This also goes for dozing terrain like Bocage, woods or rubble. The M5 will clear an area equal the width of the vehicle per action it moves through. A Dozer M5 can also be used as a makeshift mine clearing vehicle. The dozer will automatically clear any anti-personnel mines but anti-tank mines can have a chance of destroying the blade when detonated. When clearing a AT minefield roll a D20 for every action spent clearing the minefield and consult the chart below to see if the dozer is destroyed by the detonation. If the blade is destroyed, the vehicle is immobilized for D20 actions while the crew detaches the blade from the vehicle. Also roll an immediate Bog Check to see if the tracks are harmed by the explosion. If passed detach the blade as noted but if failed the vehicle's tracks are destroyed and the vehicle is immobilized. Note that when clearing any kind of minefield, the crew must be Buttoned-Up to do so. The blade will also provide additional armor for the tank's front hull. The dozer blade will cover HF 2-6 locations and will deflect incoming enemy fire but the location hit will be ruined by the incoming round. Note that each location can only be hit once before it will no longer provide anymore cover. If more then two dozer locations are ruined then the dozer will not be in working condition to perform any dozing actions. Only rounds of 50mm or large will effect the dozer in this way. When the blade is engaged, the M5's movement is halved. The blade can be engaged at anytime with a free action by the driver. Availability is a 10. T27 81mm MMC/T27E1 81mm MMC: Both models are nearly the same with only the placement of the mortar differentiating each other. The M1 81mm mortar fires HE, Heavy HE, WP, Smoke and Illumination rounds. The Heavy HE uses the Large HE template and has an AP of 25 where as the normal HE uses the Medium HE template and has no AP value. The WP, Smoke and Illumination rounds use the normal rules as such. The mortar can be dismounted but it will take the full crew 2 full actions to dismount it and then another to set it up. T29 4.2 Inch MMC: The T29's M2 mortar is capable of firing HE, WP and chemical weapon rounds. Use the normal rules for chemical and WP rounds. T39 Rocket Launcher: To increase the amount of artillery used in certain operations, it was common to mount large artillery rocket launchers on top of tanks. Although these were meant to be part of a larger fire mission, these launchers were sometimes used to fire directly at targets such as buildings, bunkers or other structures or at elevated enemy positions. To use the T39 in a direct fire mode, the target must be elevated at least twice the height of the M5 firing. Targets below this elevation will not be able to be hit as the rocket launcher was unable to depress any further. The commander uses an action to fire all the rockets and the rockets will fire off 1/2 its 7.2 inch rockets the same action used by the commander and then it will fire the second 1/2 the next subsequent action. The rockets are unguided and only need to be pointed at the general direction. Because of this, every rocket will automatically deviate from its target point. The 7.2 inch rocket could have a HE or a smoke (chemical) warhead and will both use the Large HE template. The AP of the 7.2 inch HE warhead is a 22. Note that the launcher can be loaded with a mixture of both HE and smoke so just note down how many of what type are loaded. Availability for this addition is a 5. Indirect Fire: The T27, T27E1 and T29 are all able to use indirect fire. All weapons have a minimum range of 30" and will have an unlimited maximum range when using indirect fire. M5s fitted with the T39 may only use indirect fire off the table or in a direct fire mode as noted above. T9 Recon Vehicle: Any crew member manning the AAMG on the T9 model will only receive +2 cover where as all other crew will gain the +5 Partial Tank Cover modifier. AA Model: The AA model has a small rudimentary open-topped turret armed with twin .30cal machine guns. When firing, roll 4 To Hit dice per weapon and roll for location or result for each hit. If a weapon Jams, only that weapon does allowing the other to fire as normal. It takes the loader a single action to clear one Jam result per weapon. 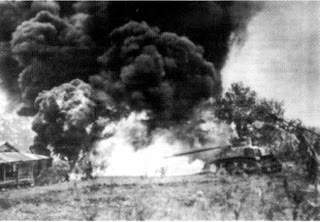 The crew will receive Partial Tank Cover from enemy fire from the front but will not receive any cover from flank or rear fire. Deep Wading M5s: Deep wading M5s are fitted with tall ducts to the engine that allowed the air-tight tank to move partially submerged under water. 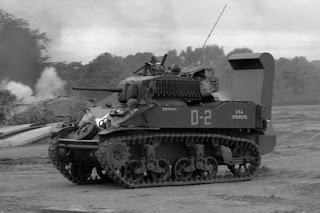 These were designed in response to the horrendous actions of the Duplex Drive M5s during D-Day. Deep wading M5s can transverse water by moving at 1/4 its normal speed while in the water. If the vehicle or ducts are penetrated while in the water, the tank will be lost and the crew will be KIA unless they pass a 1/4 Skill Check to escape the drowning tank. All To Hit rolls to a swimming M5 will be at a +2 due to its small size when in the water. 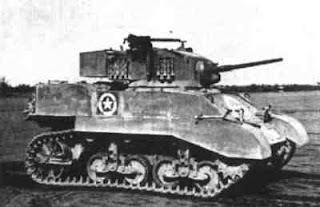 The M5 can only fire its machine guns if partially submerged. Follow all amphibious rules as normal. Availability is a 5. Wargaming Piece: There are several companies that make a 1/48 scale M5 and with a bit of converting you can make just about any of the other models without much fuss. 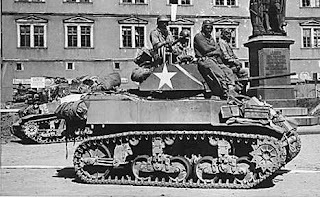 Hi, is it ok for me to use the photo of the M5A1 Light Tank? it's for my web page and I would write a credit as to its source and origin.